Australia Map Clip Art: Explore down under with your budding geography students using this pack of geography clipart. 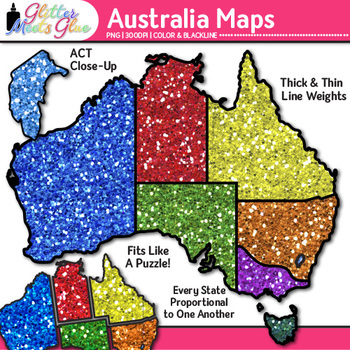 Design engaging lessons on map skills and how to use a compass rose using these Australian maps. Make worksheets to test your student's knowledge on cardinal directions and how to read a map legend. Each individual state clipart graphic fits snugly next to its neighboring state(s).